The full kitten caboodle for Labo VR (dubbed "Toy-Con 04") is $79.99 for the goggles and five ancillary accessories. You can also pick up individual items or the aforementioned goggles bundle (which comes with a blaster) for $39.99. For the purposes of this assessment, I had access to everything. As usual, building it is part of the fun: unless you absolutely hate building things, at which point you can probably check out of this article and Labo as a whole posthaste. Nintendo roughly estimates that it'll take you six hours at minimum to build the goggles and the five accessories, with an eleven-hour guess on the high-end. As is the case with my other Labo builds, the low end is usually on point for most adults. I don't judge, though. The gist is that you're basically building a shell for your Switch unit, which slides into a little slot and is held in place by a separate cardboard lock. 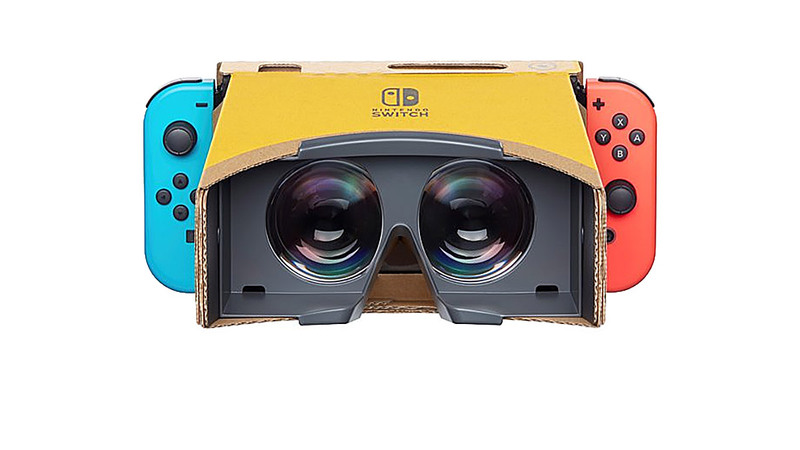 Nintendo provides the actual goggle interface and the Switch can be toggled into "VR mode," which separates the screen like two living cells (complete with a cute animation) to fit into the eye holes. Now, you're gonna get God rays, and your Switch glass needs to be really clean (it is the screen), but it works. Having used every single major VR headset to date, I came in expecting a lighthearted take on the technology and that's exactly what I got. You probably remember witnessing VR a decade or two ago at a county fair or something: this is more akin to that than the boundary-pushing, "let's strap a PC to your head capable of dual 1080x1200 90Hz (or higher, now)" displays. 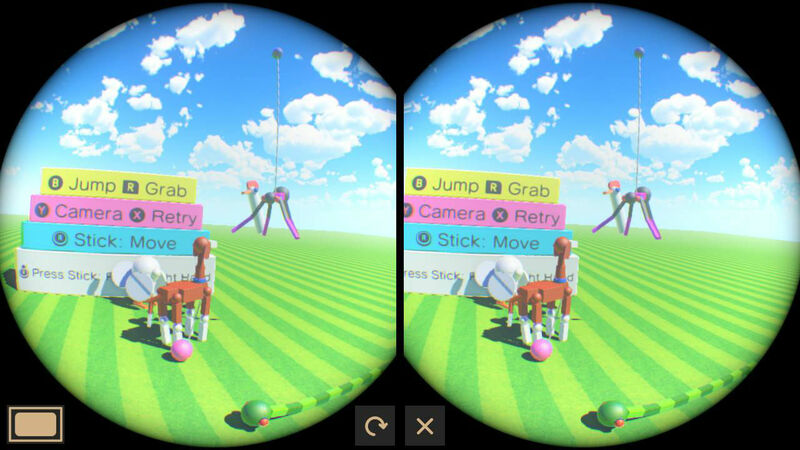 Perhaps the only vestige of modern VR that Labo retains is the concept of field of view, where you can swivel your head around and view a full 3D space. While you can technically use your own headphones (there's a slot at the top), the main flaw is that nearly everything, even the giant gun, requires you to hold the mechanism up to your face. 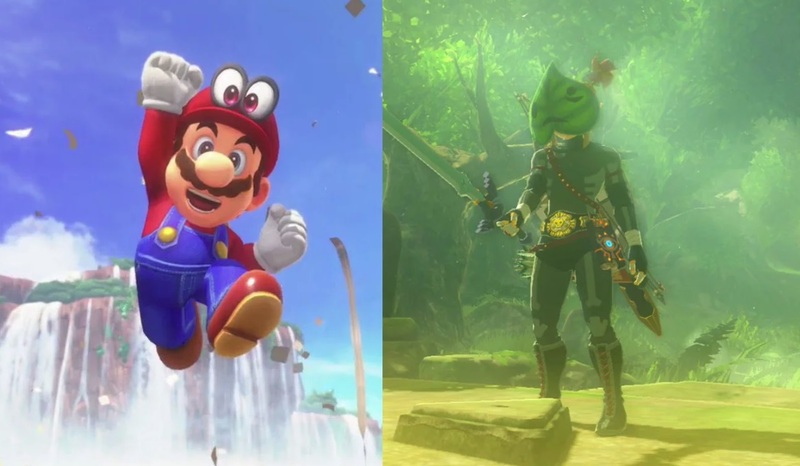 Nintendo accounted for this somewhat by making the accessories comfortable to hold and only requiring the one-handed Joy-Con for the goggle-only micro-games, but over time it becomes a burden and inhibits long-term play. I can spend hours in the Oculus Rift, but with Labo, not so much. With the basic goggle construction you get 16 minigames to choose from: things like controlling a robot to break blocks, batting practice, or more esoteric activities like a petting zoo where you can rip the head off of a chicken (see below). Most of them are 30 seconds long and the accessories offer meatier side games that will run you roughly an hour or so with all the extra trimmings. The real longevity, like other Labo kits, is the creation tool suite (where you can essentially program your own minigames or customize the tech like educational coding software). At this moment in time that's basically it for Labo VR. The two heaviest hitters — Zelda: Breath of the Wild and Mario Odyssey — are coming later this month, and weren't available for testing. It's kind of like how the wheel and pedal kit shipped with various (albeit fun) tech demos and not Mario Kart 8 Deluxe support until it was quietly added later. Let me just point out that Labo VR has a camera accessory and there is zero talk of a Pokemon Snap revival, even in minigame form. It kind of shows where Labo lies in terms of Nintendo's priority list, which is probably for the best given their penchant for going too hard on accessories and promptly pulling support when they don't sell gangbusters. I dig Labo! It's fun to build projects on my own, with my wife, and hopefully one day, with my kid. If you enjoyed previous kits with your family you'll probably like spending a weekend with this one, even if it won't be making the rounds and wowing Late Night audiences.